My husband and I waited to have children – and found ourselves on the brink of having waited too long. I sat in the doctor’s office, anxious for the results of our fertility tests. Dr. Patrizio pronounced prescriptive words and foreign concepts – unfamiliar even before they rolled off his thickly-accented tongue. “IVF…ICK-zeee…COH…CVS…” I scribbled on a piece of paper, hoping I caught enough of the acronyms to look them up later, and tried to keep up as he hurled terms toward me like a spelling bee massacre. The gist was that, while not impossible, it was improbable we could conceive without intervention. The following week, we met with a nurse assistant who shared with us an entirely different, yet equally strange, set of vocabulary and instructions. She pulled out visual aids, a wad of scripts to fill, and a photocopied diagram of what appeared to be an eight-year-old rendering of a female human body, with dotted-line arrows veering off to various fleshy body parts, ripe for injection. With broad, demonstrative strokes, she went back over the arrows with her ball-point pen, as if the emphasis somehow made everything clear. Tolga returned later that day with the pharmacy’s version of Bloomingdale’s BIG brown bag, filled with all sorts of individually-wrapped IVF accessories and medications, some needing refrigeration. I cleared out the leftover lasagna to make room for the “new tenants” and stood in front of the bag, unable to fathom how ANYONE would allow non-medical professionals to go home with these implements – to say NOTHING of actually putting them to the prescribed use. I had a slight complicating factor – a childhood cancer that, after etching into me various physical scars, also bequeathed a reactionary fear of injections. I cried for 3 straight days. And Tolga smoked countless sympathetic cigarettes. Took some getting used to, but eventually, and true to the advertised odds, on our third cycle we were pregnant. We started to think of names. Then, one night after moving a box, a stupid box of trains, the ground on which I stood started to shift. I was desperate to get out of Connecticut, where we’d been living temporarily, and get back to New York City. I had started packing months before the actual move and I lifted a box of old HO-scale model trains, heavier than anticipated. Almost immediately, from deep within I felt an intense, trembling ache. I put myself on the couch, pretended to be listening to my husband talk, and panicked in silence that my relentless inability to sit still may have harmed my pregnancy. It was the first time I hadn’t turned to Tolga for comfort. The next night at tap dance class, I felt the same ache. And later that night, at a friend’s apartment in the city, I started to bleed. Frantic, I called Tolga, then I called the doctor. The morning’s ultrasound revealed a pool of blood hovering over our kidney-bean-sized baby. Dr. Patrizio looked over the photos, shook his head, and uttered, porca miseria… – a familiar Italian phrase to me, as I had heard my grandmother use it hundreds of times, usually reserved for moments of more-than-mild catastrophe. I was bed-rested at 8 weeks. The next couple of months were a blur of bleeding, “googling,” hospital stays, and worry. I understood now the inner workings of torture: break the spirit by providing a constant level of anxiety and uncertainty, while simultaneously depriving of food (during each hospital stay, in case emergency surgery was needed) and sleep. In the winter of my annual February discontent, I went especially stir crazy – on the bed, on the couch, in the hospital. I had long hours of fear, of feeling trapped, and of an acute guilt for the predicament in which we now found ourselves. At 20 weeks, we knew we were having a boy. He seemed perfect in every way, except for the threat – quite literally – looming above him. I prayed for my son’s life, I prayed for resolution – one way or another, I prayed for forgiveness. During those months, we moved back to New York. I was home again. And despite the noise and the crowds and the air pollution, I could breathe easier. Then, one afternoon, resolution came. Lying on the couch, reading nothing of consequence, I felt a rush of fluid. I was bleeding again, or so I thought. I called my new doctor – my college friend and maternal fetal medicine specialist – who cradled me in her care at Cornell as soon as we moved back. At the hospital, I learned the blood clots had weakened the gestational sac to the point that, likely, it had been slowly leaking amniotic fluid until it finally ruptured like a water balloon. And at 23.5 weeks, he could not survive, his lungs hadn’t yet fully formed. It was too soon. Just a little too soon for him. Adding searing insult to this egregiously painful injury, I had to physically go through labor and childbirth – but without the tremendous prize at the end. I was discharged two days later – on Mother’s Day. From the passenger seat, I mused sardonically about the coincidence as we pulled out of the hospital’s parking garage. The sun shone brightly against a brilliant, blue sky. Weather knows nothing of heartache or sympathy. Finally, in the privacy afforded to me in our own car – privacy otherwise unavailable during the last 48 hours of my hospital stay, I broke down in tears and wept the entire way back to Morningside Heights. I can’t recall a single moment in my life that left me so bereft, so empty as that sequence of events – being in the delivery room, giving birth to my baby, and then leaving without him. A pregnancy so difficult to achieve, so long in the making, was lost cruelly and unceremoniously. It’s been six years now. Six years. I wish I could say it no longer saddens me – or that I’ve forgiven myself. Parts of me have healed, other parts not yet reconciled are usually buried in the flurry of current-day activities. Sometimes my idle mind wanders to him, wondering who he would’ve been, what bedtime stories would be his favorites, what his hugs would feel like, how he’d feel about his little sister. And I am reminded of the great harm – albeit unknowingly – I am capable of inflicting. Good things don’t necessarily come to those who wait. Sometimes you get lucky, despite yourself, and sometimes you don’t. And to ease miserable moments, I make Yayla Corbasi, Eastern Anatolian yogurt soup – my favorite go-to Turkish comfort food. It is yet another wonderful way the Turks use yogurt for savory nourishment. If you’re in need of comfort food, and want something different than mac-n-cheese, this won’t let you down. In a large bowl, combine the yogurt, egg yolks, and white rice flour until smooth. Slowly add 1 cup of cold water to the yogurt mixture. Add the yogurt mixture to the soup, passing the yogurt mixture through a sieve. Stir and cover for an additional 10-15 minutes, cooking the egg yet being careful not to boil. 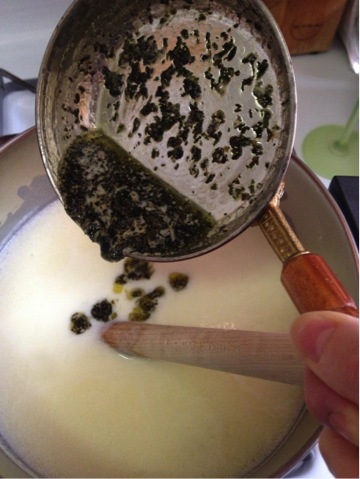 Melt the butter in a small saucepan until it gently sizzles, and add the dried mint, crushing it as it is added to the butter. Stir, and then slowly add to the soup along with additional salt, to taste. This soup not only stays well in the refrigerator but also freezes well. If it thickens the next day, simply add water, heat, and serve.